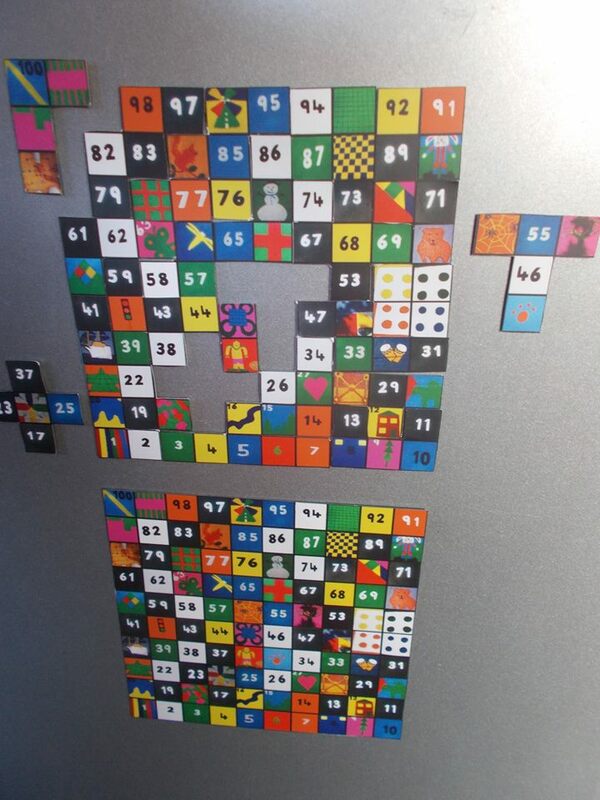 A magnetic game to be used at school or at home on fridges or on other ferromagnetic materials. It comprises of a magnetic base map and 26 magnetic pieces made from 12 different geometric shapes. 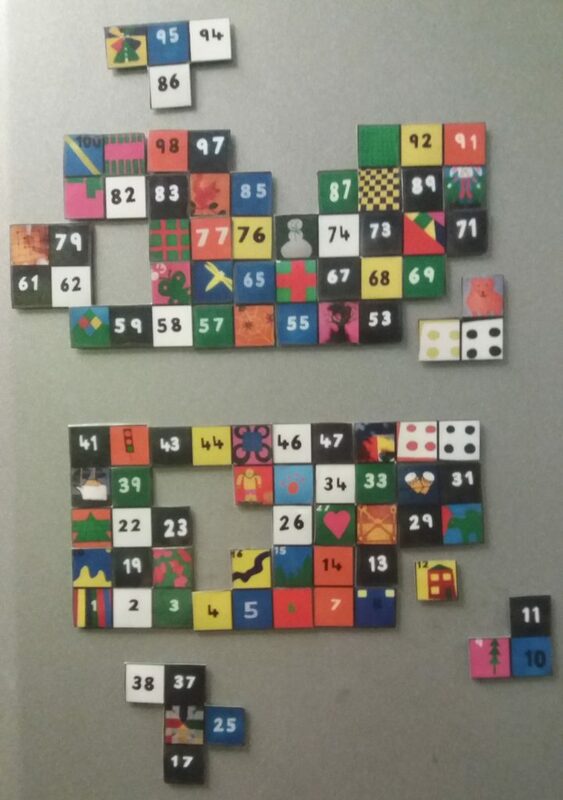 The game is based on the design of the KS2 MAGIC SQUARE and can be used as a stand-alone game and learning resource as well as in conjunction with a giant painted MAGIC SQUARE at a school. 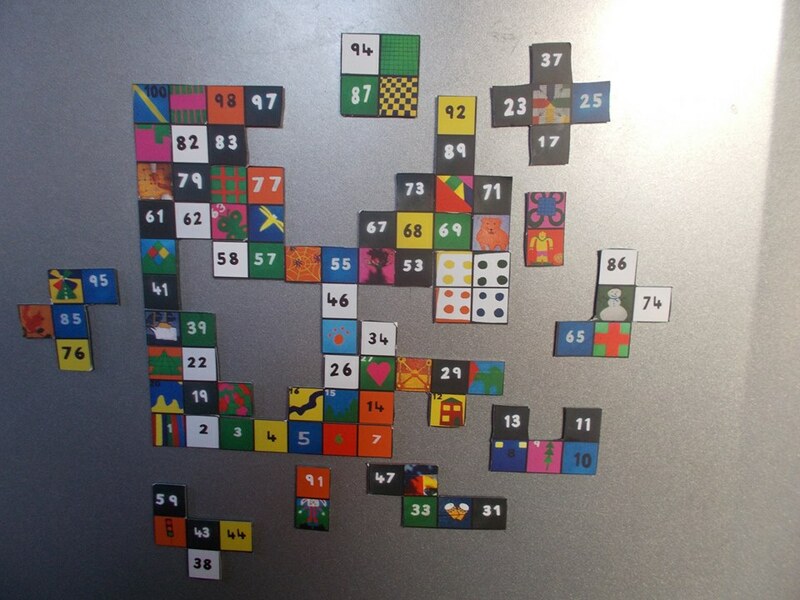 1a) JIGSAW GAME (Build a map): The base map is placed on the ferromagnetic surface and the players then places the pieces on top of their matching position on the map. 1b) The map is placed and then the player tries to make a copy of the map with the pieces next to the base map. 1c) The player tries to form the jigsaw without reference to the base map, this can also be done on the back of the base map. 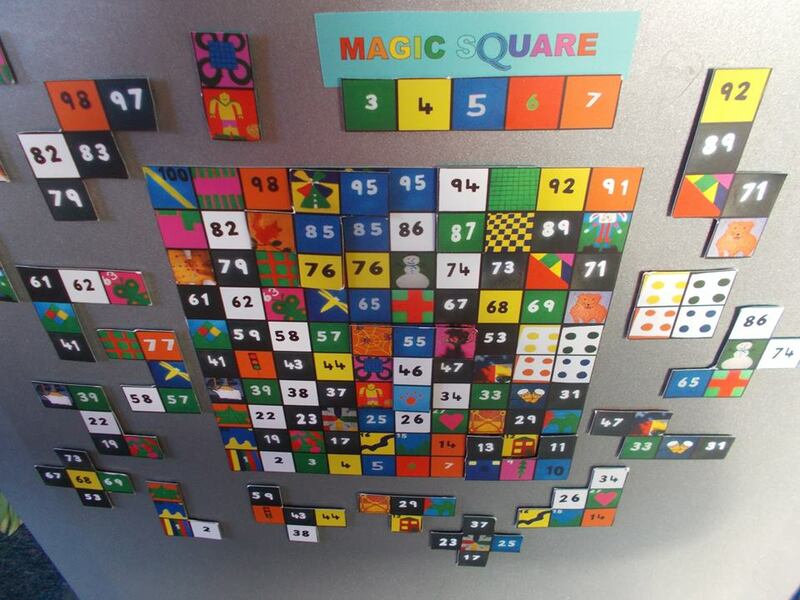 2) COLOUR CODE: The MAGNETIC SQUARE follows the same colour code as the KS2 MAGIC SQUARE so it can be used either with a player’s fingers or pieces to show the connections (“break the codes”) between the colours and the multiplication tables. 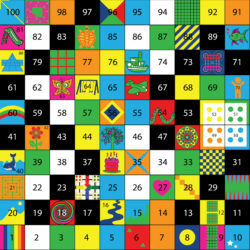 All green squares are multiples of 3, yellow squares = multiples of 4, light blue = 5, red = 6, orange =7, dark blue = 8, pink = 9. 3) SYMMETRY RACE: The 26 pieces can be divided into 2 sets of thirteen identically shaped pieces one set makes the top half of the game and the other set the bottom half. A line of symmetry can be drawn diagonally between opposite corners of the base map. 2 teams or players can be given 1 set of pieces each and race to see who can form their half of the map first and then look at which pieces match with those in the other half. 4)INVENTAGAME: The players are given the pieces and asked to invent their own games or form their own shapes. Extra pieces can be made for example 2 small cardboard people can be made, cut out and magnets placed on the bottom and then used to play the game as a race game with a dice or magnetic snakes and ladders cut out and placed on the base map. The possibilities are as numerous and varied as the players imagination. 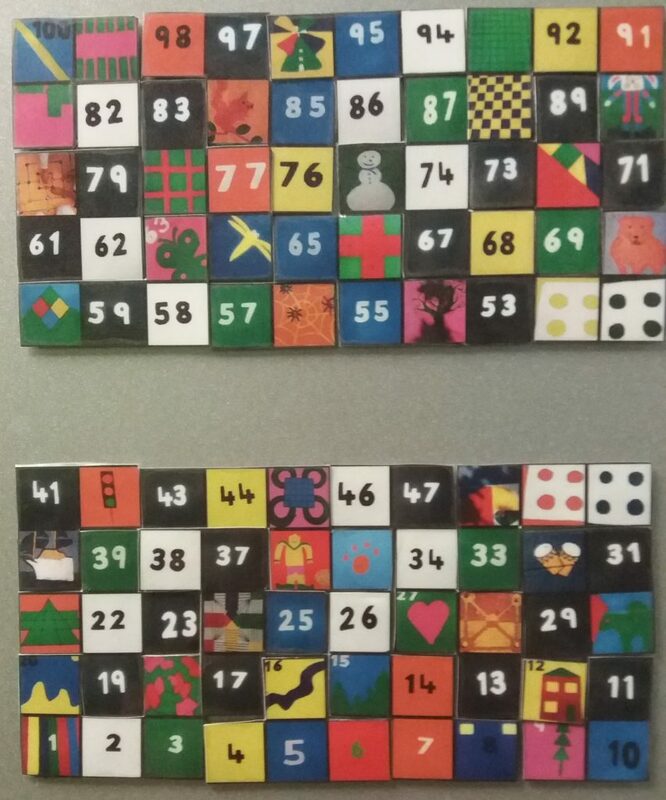 It is quite easy to make a MAGNETIC GAME, using any image you wish, local places, members of staff or the students own faces can be used made into magnetic jigsaw pieces and then pieced back together.